Sabayon Linux 13.08, a desktop distribution based on Gentoo following a rolling release model and providing multiple desktops, was released today: "This is a monthly release generated, tested and published to mirrors by our build servers containing the latest and greatest collection of software available in the Entropy repositories. Linux Kernel 3.10.4 with BFQ iosched, updated external ZFS file system support, GNOME 3.8.4, KDE 4.10.5, MATE 1.6.2, Xfce 4.10, LibreOffice 4.1, UEFI SecureBoot for 64 bit images (with bundled UEFI shell), systemd as default init system, Plymouth as default splash system and new high-dpi artwork are just some of the things you will find inside the box." Read the official press release for more details including various links. Download (torrents): Sabayon_Linux_13.08_amd64_GNOME.iso (1,973MB, MD5, torrent), Sabayon_Linux_13.08_amd64_KDE.iso (2,469MB, MD5, torrent), Sabayon_Linux_13.08_amd64_MATE.iso (1,189MB, MD5, torrent), Sabayon_Linux_13.08_amd64_Xfce.iso (1,618MB, MD5, torrent). Sabayon Linux is a Gentoo-based distribution which follows the works-out-of-the-box philosophy, aiming to give the user a wide number of applications that are ready for use and a self-configured operating system. Sabayon offers the user an easy-to-use workspace with a captivating look, good hardware detection and a large number of up-to-date software packages installed by default, with additional software available from a repository. 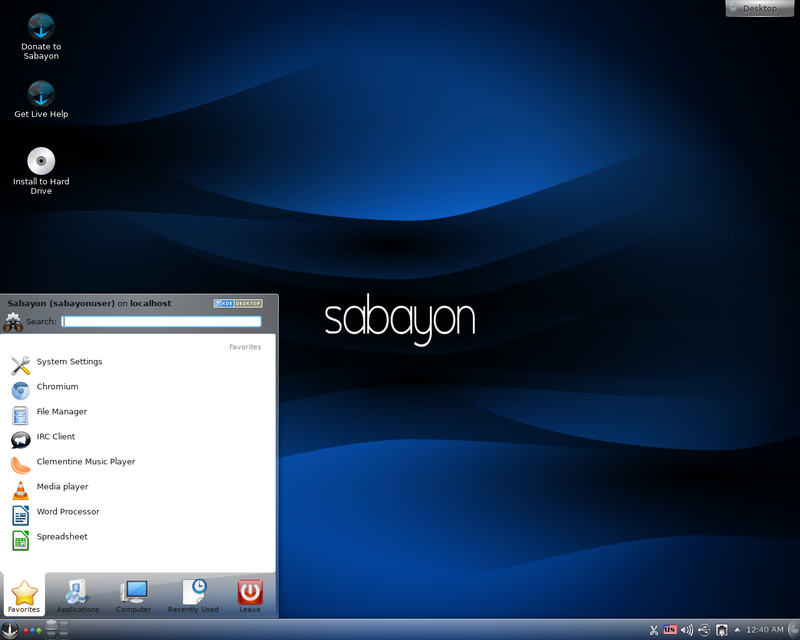 Sabayon is available in several flavors featuring respectively the KDE, GNOME, LXDE, Xfce and Enlightenment desktop environments.